Among the key challenges all face is ensuring that the quality of the laser beam—and therefore its ability to provide consistent and strong enough light to the drone—tends to degrade with distance. Researchers at LakeDiamond, a spinoff of the Swiss Federal Institute of Technology, think their solution could be the dilithium crystal of roaming drones. They have developed an artificial diamond that can help a laser beam maintain its quality over much longer ranges, and say ground-based networks of these diamond-enhanced power sources could send drones flying great distances, without wasting power to haul their big batteries around. 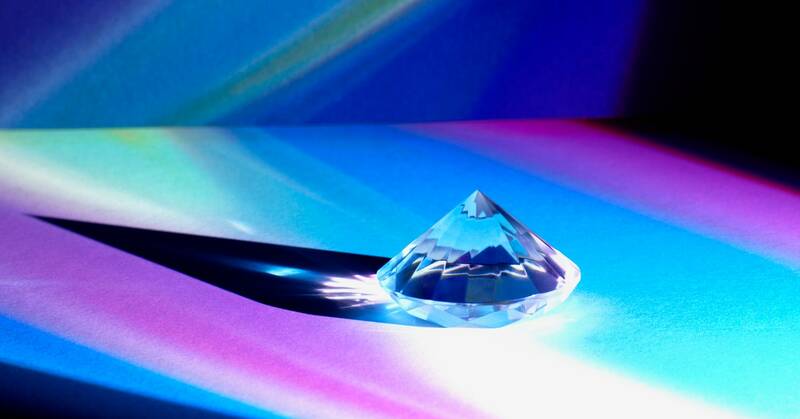 LakeDiamond CEO Pascal Gallo says the company’s lab-created diamond—a smooth, tiny rectangle placed directly in front of the laser source—can convert a low-power laser diode into a beam with consistent, parallel rays that can stretch several hundred meters. Diamonds, you see, are excellent heat conductors and transparent to light. They can take a high-density laser beam that produces a lot of heat, and dissipate that heat, allowing more energy to pass through. LakeDiamond’s gemstones—purer than natural diamonds and manufactured by layering carbon atoms in a crystalline pattern—are etched with a grating on the surface that generates a mirrored effect that determines the width of the beam. The current test system the company has developed uses a 1.55 micrometer laser to deliver 4 watts, the equivalent of 10,000 laser pointers. It can power small palm-sized drones—large enough to carry cameras—for indefinite periods of time at distances of up to 10 meters. The next step, Gallo says, is for them to be able to power professional drones by delivering up to 100 watts of power at up to 100 meters, which they expect to achieve within the next couple of years. Diamonds may not be enough to make that happen. Robert Byer, a professor of photon science at Stanford University, says that today’s laser technology is robust enough for those power needs. “Even laser pointers at just 5 watts can be enough to power a drone nearby.” The problem, he says, is that solar cells generate about 200 watts per square meter. One mounted on a drone would need to be large enough to be useful without compromising the drone’s mission. If it does work as advertised, though, drones could fly without heavy batteries at all, assuming they operate along a network of these power-transmitting lasers aimed via GPS-based tracking systems. (The aircraft would have a batteries on board as a backup, with enough power to land.) Given the compact size of the ground-based power stations, they could operate over hundreds of miles, and even recharge batteries for drones that might need to stray away from the make line for deliveries or other functions. A palm-sized drone consuming 2 to 3 watts with a run time of 30 minutes could recharge in just one minute, LakeDiamond says. Eventually, the same tech could also be used to beam energy and data to satellites orbiting at up to 700 miles above the surface of the Earth—an effort for which LakeDiamond just secured funding from the Swiss Space Center and the European Space Agency. And to bring in some extra cash, they’re tapping into the consumer diamond market to fund their research. A 1 carat, 5-milimeter “brilliant round” diamond made with their process sets lovebirds back just $750—thousands less than a natural diamond. It might not power a drone, but maybe it could be delivered by one, batteries not included.